And the winner is the Renault Megane 1.9 dCi hatch turbo-diesel. In Europe the motoring writers rated it so highly that they declared it Europe's Car of the Year for 2003, even before it was even made available for sale to the public. The new Megane also became the first vehicle in its category to be awarded the Euro NCAP Five-Star rating, underlining the high level of safety afforded to owners of the car. It shares the sought-after safety rating with the Renault Vel Satis, the Renault Laguna II, Espace II and Scenic II giving the company five qualifiers and making it a world leader in the production of safe cars. Further awards have come from the leading German motoring magazine, Auto Motor und Sport, whose braking tests put the new Renault Megane ahead of all other competitors in its class. Another top motoring magazine, Autocar, bestowed its Design Award on the Megane and Automobile Magazine made it winner of their Design Trophy. Renault South Africa's managing director, Roland Bouchara, says these awards all underline the very positive attributes that the Megane range bring to the market place, "locally and in the rest of the world". 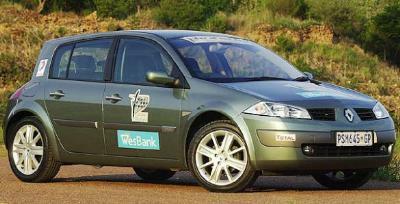 The 2004 South African Car of the Year competition was sponsored by Wesbank. This is the fourth year in a row a diesel-powered car has won the event. Previous diesel winners were the BMW 320d, Audi A4 1.9 TDI, and the VW Polo 1.4 TDi. It is also Renault's second South African Car of the Year winner. In 2000 the popular Renault Clio came out on top. I know Isuzu has reserved the "Go big" slogan for its new KB range, but Toyota has really gone BIG to celebrate 35 years of Hilux in South Africa. Only R130 702! Find this bargain and other great deals on quality used cars at Wheels24's revved-up Find-a-car page.